We appreciate you supporting Lighten Up Gear and we in turn want to support others. As a result, we earmark 10% of our profits to go to charitable organizations. We believe that God is calling us to something greater than just designing, printing and selling funny Christian t-shirts to you fine folks. We want to make a difference…for God’s Kingdom. 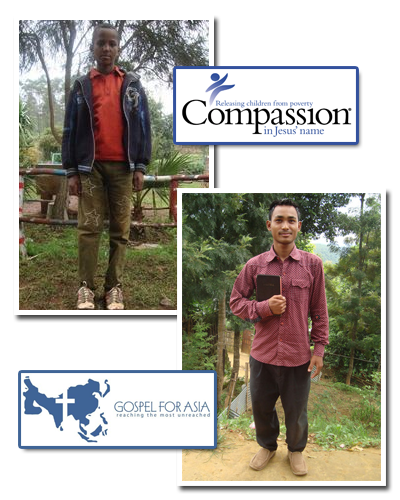 That’s why we’ve partnered with Compassion International and Gospel for Asia (GFA). Believe it or not, you’re already making a difference in Ethiopia and India. Bacha is a child that we’re sponsoring through Compassion International and lives in Ethiopia. Bilibond is a missionary we’re sponsoring through Gospel For Asia and lives in India. To read more about Bilibond, check out our blog post.